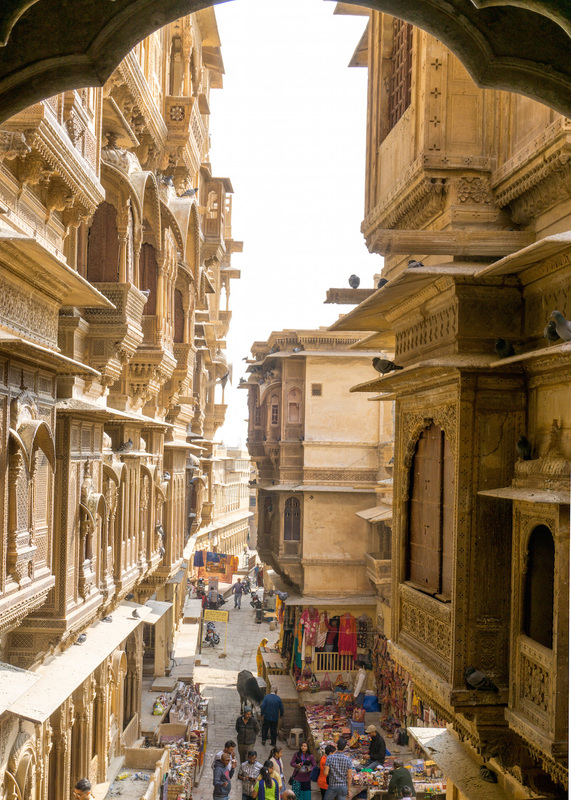 Jaisalmer is Rajasthan’s Golden City. Not just golden as in old, but golden as in literally golden in color. 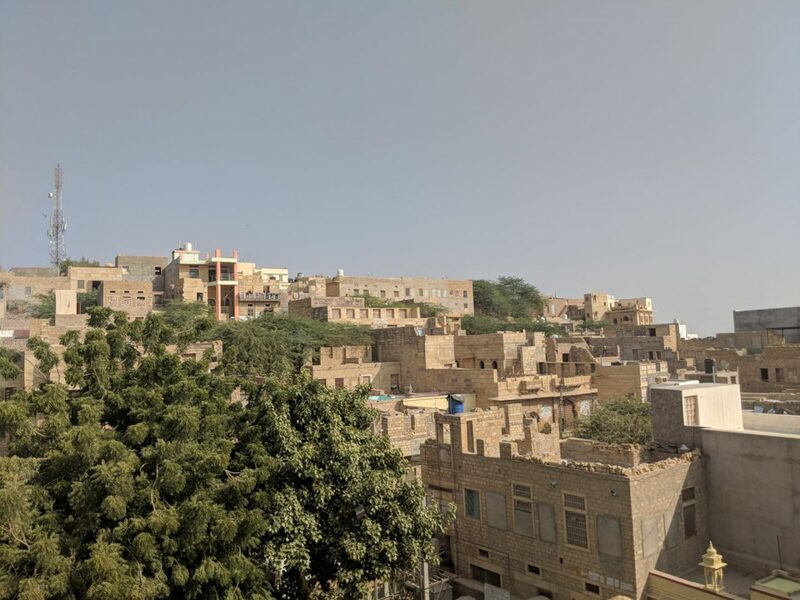 The whole town is built in yellow sandstone, and stands at the edge of the yellow Thar desert. This gives it a gorgeous, warm, yellow color and hence it’s nickname. 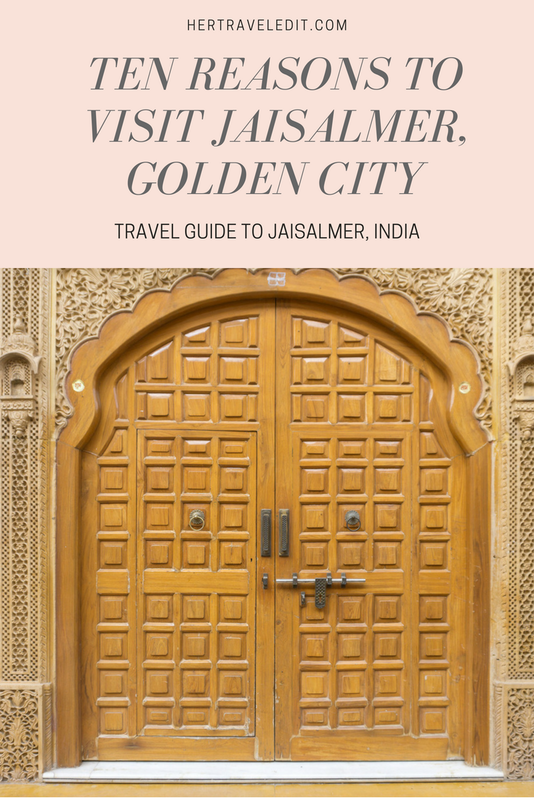 We were debating whether to include Jaisalmer in our Rajasthan trip since it is a bit out of the way, but my mom insisted that we do. 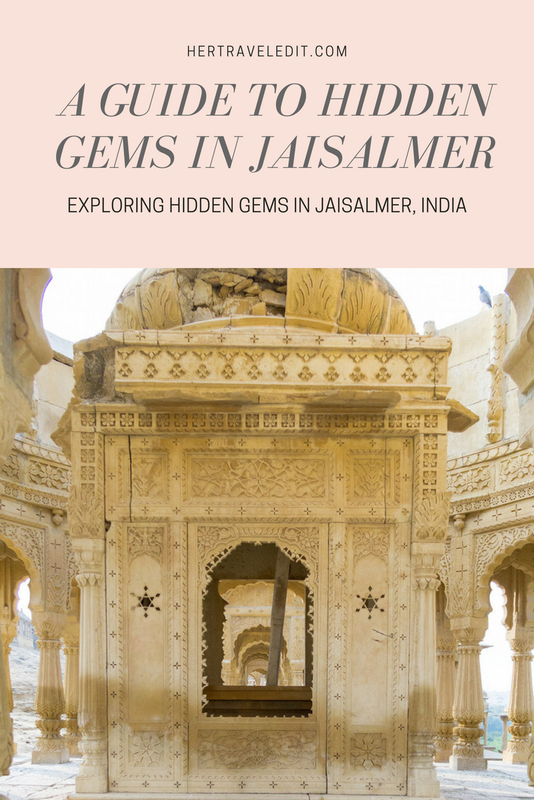 I’m so glad we listened to her, because Jaisalmer is gorgeous! It’s a lot smaller than the other cities, a lot more unspoiled. 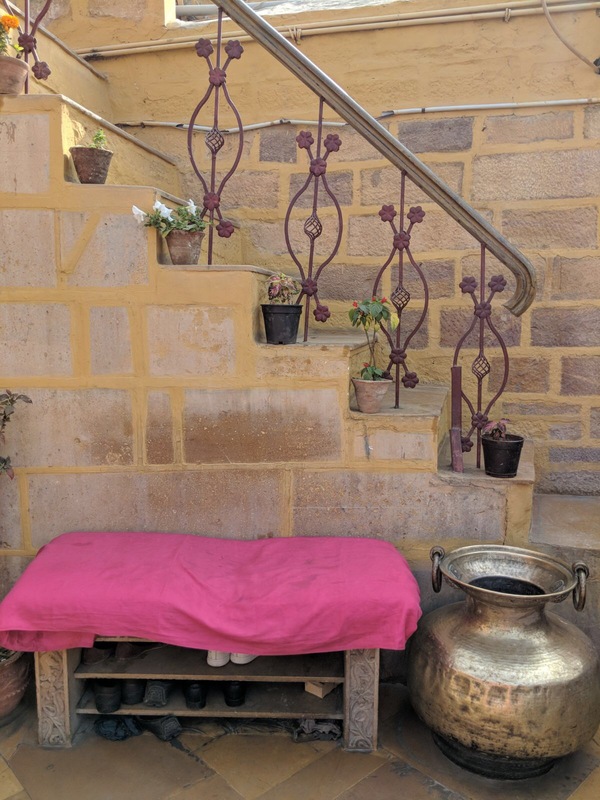 There’s more of a village feel to Jaisalmer, and it’s interesting to see how people lived and still live in the desert. The staple food is “ker-sangri”, a vegetable curry made with the ker berry and sangri beans that grow in the desert. They include a lot of fried wheat preparations even in their curries, since vegetables are so scarce. 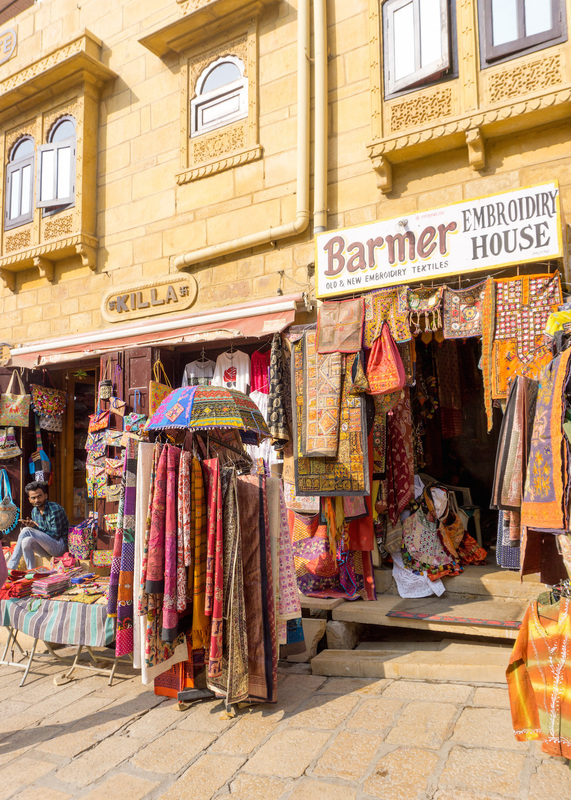 The traditional turbans that the men of Jaisalmer still wear showcases their clan, but also has many practical purposes. It protects against the desert heat, wind and sand. It can be used as a pillow if needed, as a rope, or even to fetch water from a well. 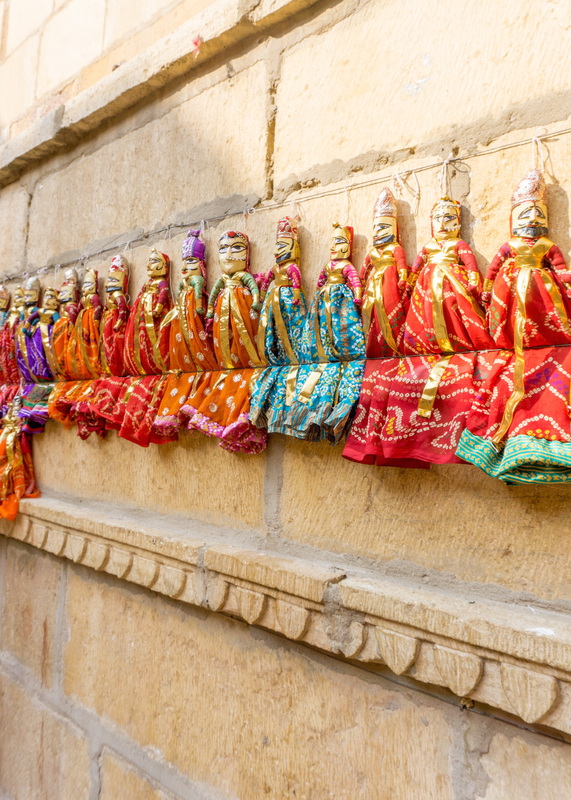 The whole concept of Jaisalmer is to make the most of what you are given, with a laugh and some music! 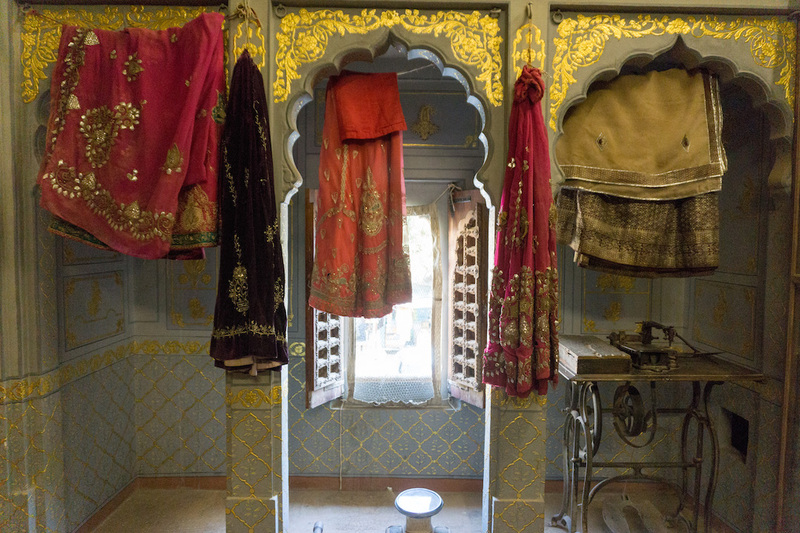 Bada Bagh was my favorite part of Jaisalmer. 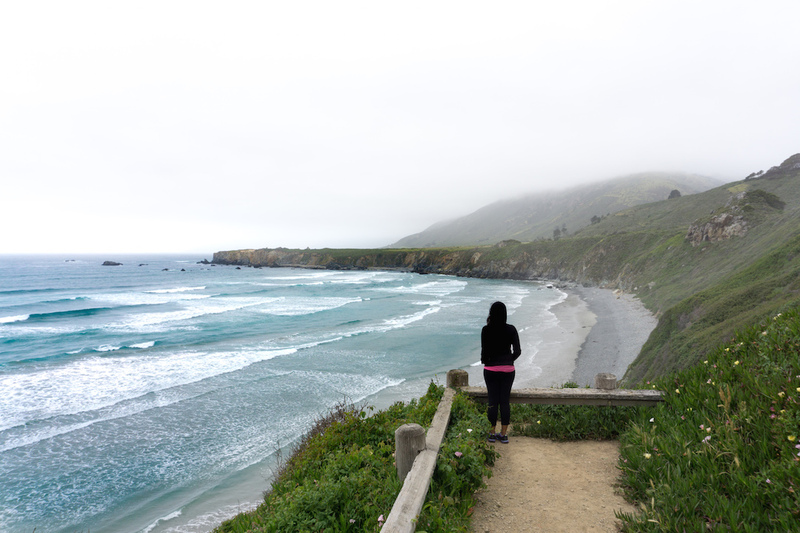 It is still off-the-beaten-path, which means less crowds, and much more enjoyment! 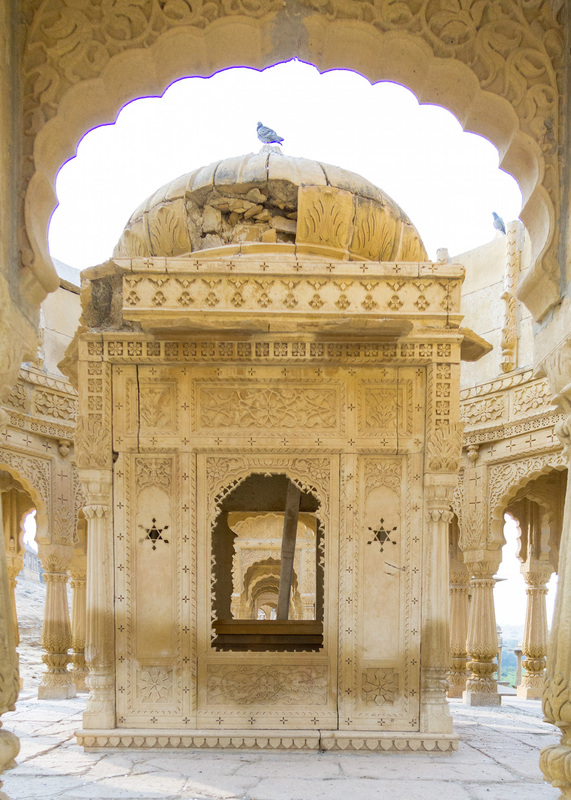 If you go to only one place in Jaisalmer, please go to Bada Bagh in the morning, as soon as it opens at 9 am! Bada Bagh means Big Garden. 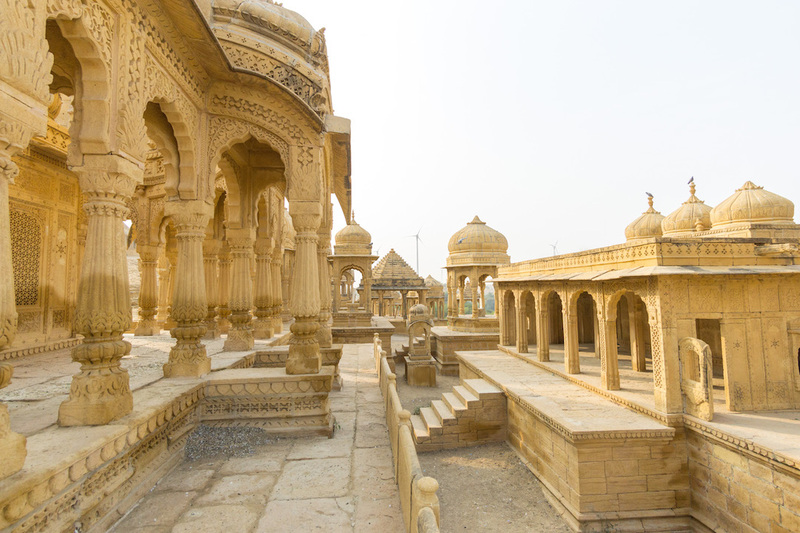 It houses the Royal Cenotaphs (a tomblike monument for someone buried elsewhere) of the Maharajas of Jaisalmer. It sits before several windmills, showing the exquisite juxtaposition of old architecture and new technology. 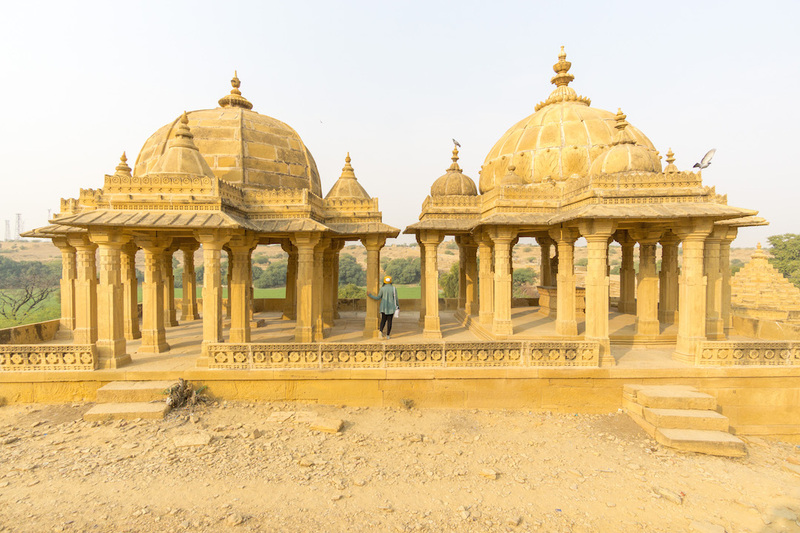 It also overlooks a mango grove, a shocking patch of green among the yellow sand and yellow sandstone. 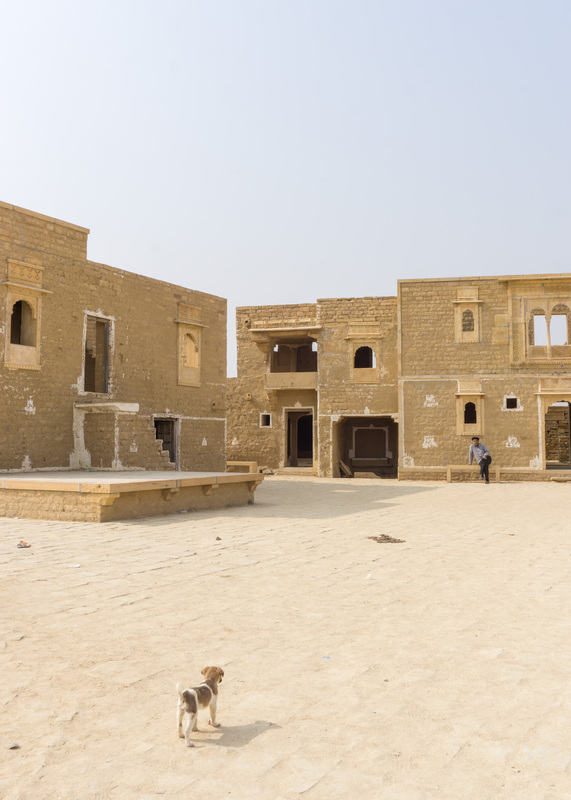 Jaisalmer is home to one of the worlds last remaining living forts. 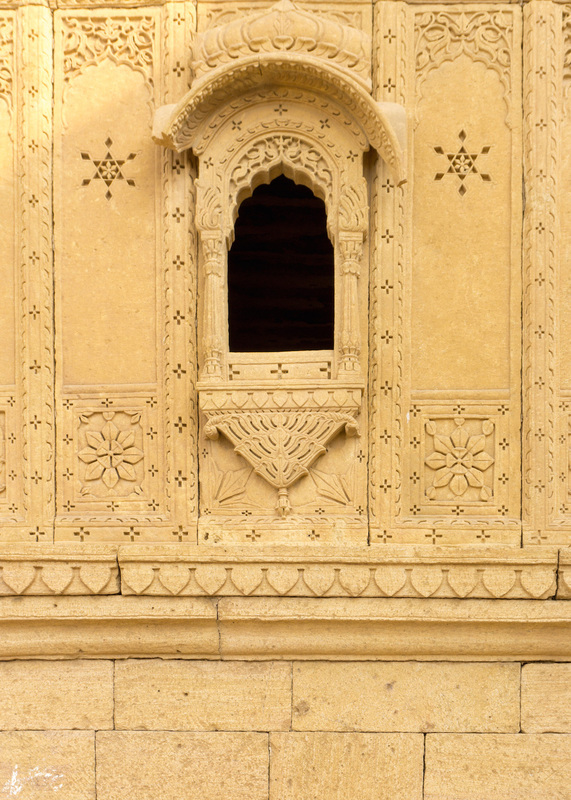 The Jaisalmer Fort (aka Golden Castle) is now a UNESCO world heritage site, and a must visit. It contains thriving shops, restaurants, and houses within it’s walls. 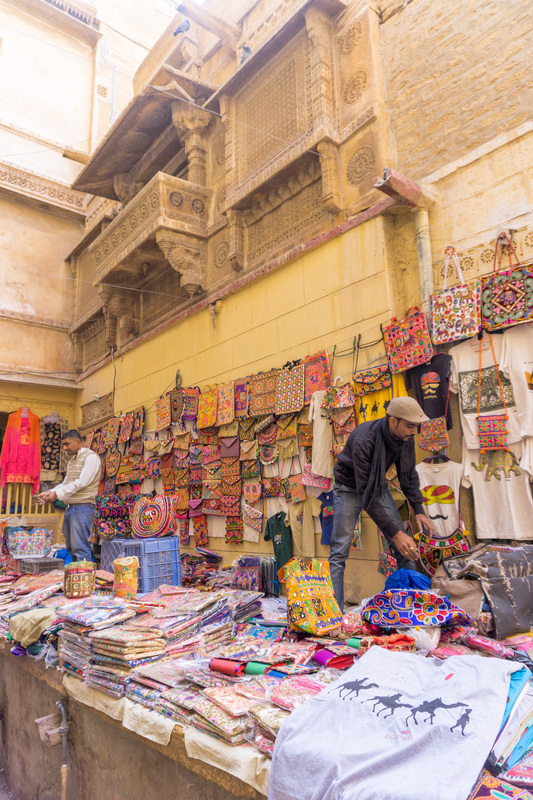 Jaisalmer is well known for it’s handmade camel leather goods. 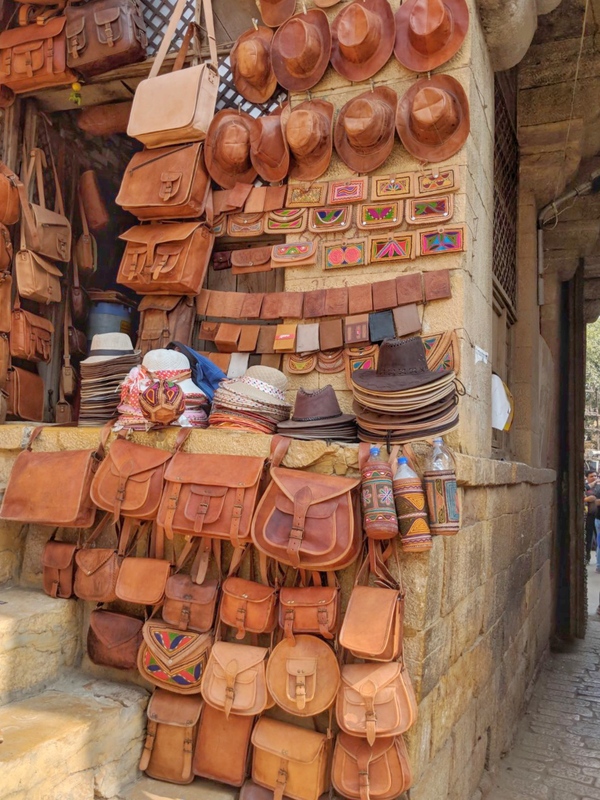 Beware though, a lot of sellers might pass off goat leather as camel leather for higher prices. I recommend the shop to the left just inside the Gates of the Fort. 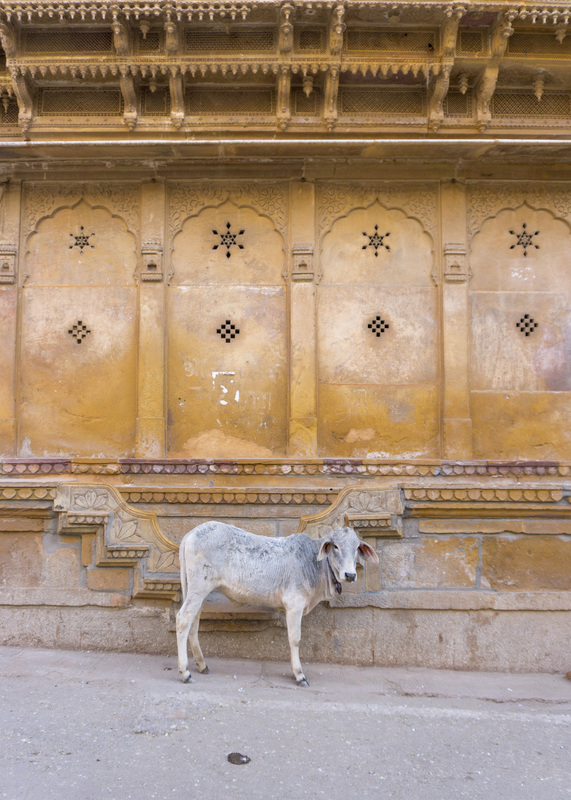 I think pictures speak better than words for this particular Jaisalmer feature. 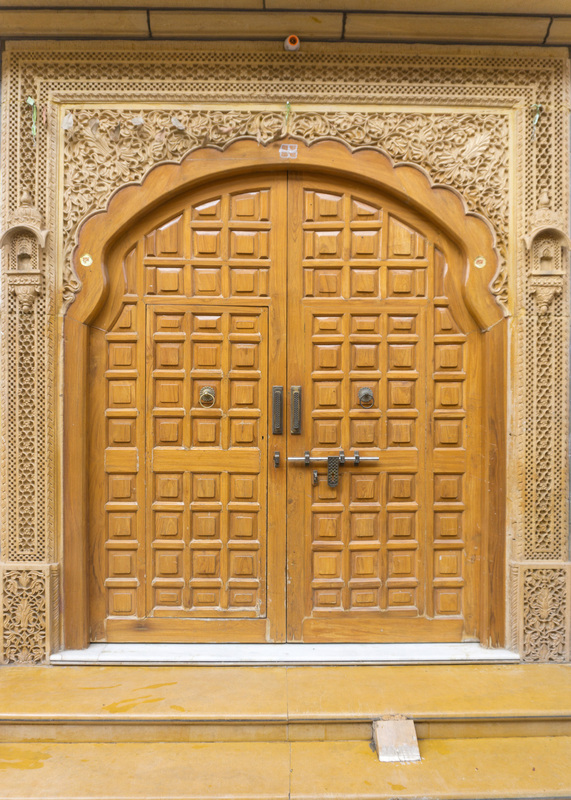 Trust me, you don’t have to look very hard for beautiful doors and windows, just walk the streets of the old town of Jaisalmer. 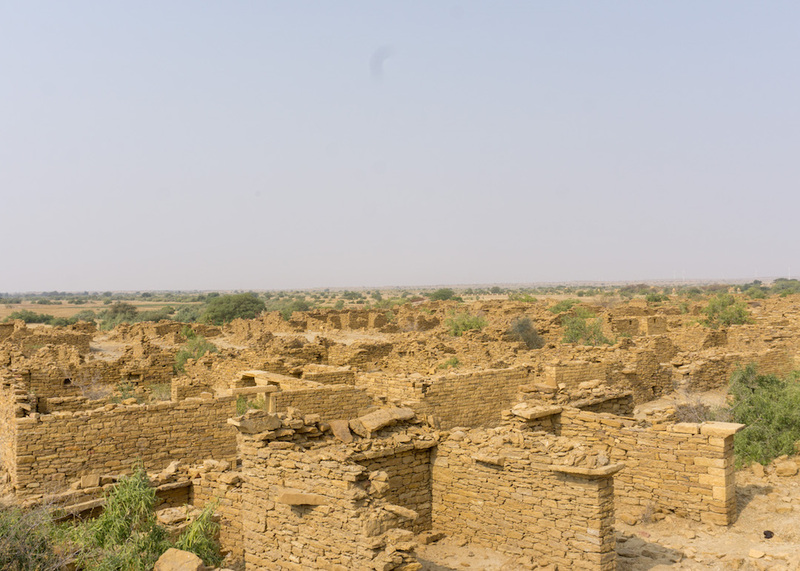 Kuldhara, a 13th century village, is a short drive from Jaisalmer toward the desert. One fine day in the early 19th century, an entire population up and left this city! The reason is a mystery – was it an earthquake? A bad ruler extracting too much money? A crop failure causing famine? Or was it ghosts? 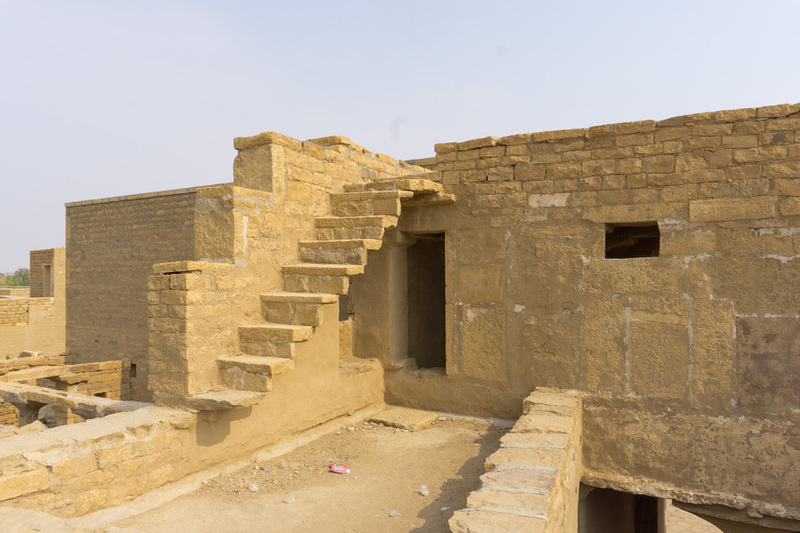 You would have to visit Kuldhara and see if you can come to a conclusion! Haveli is the Hindi word for mansion. 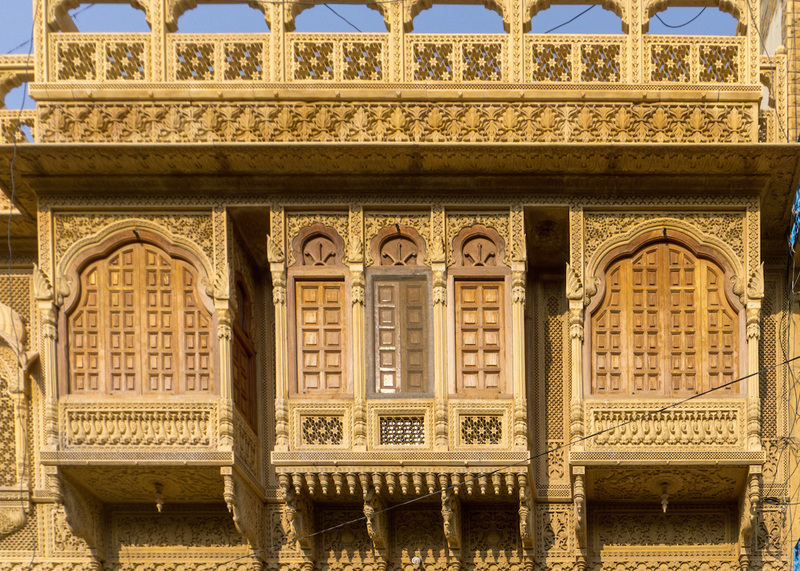 Patwaon ki Haveli means the Haveli of the Patwa family, aka the Patwa family mansion. 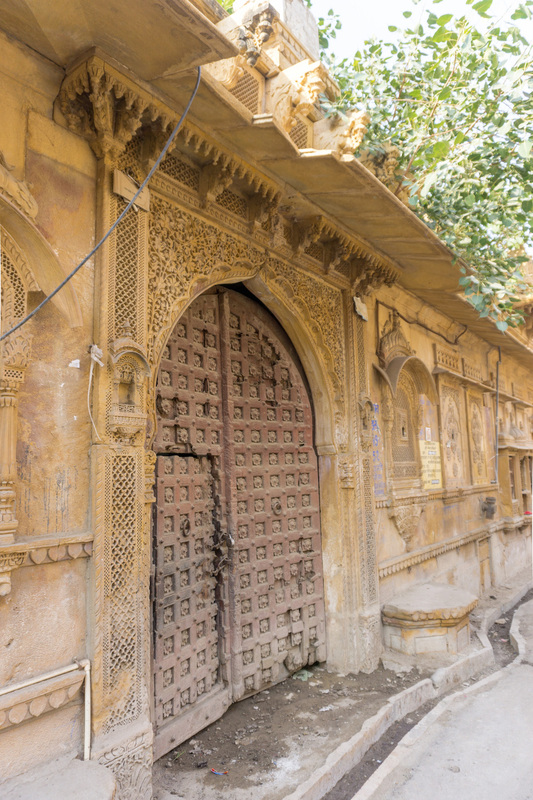 This includes five buildings, carved out of yellow sandstone with gorgeous, exquisite detailing. We toured the first building, which has the most rooms open. This is a good way to get to know the culture of this business family, how they lived, how they hid their money. I highly recommend getting a guide, because the explanations are as important as seeing the rooms. 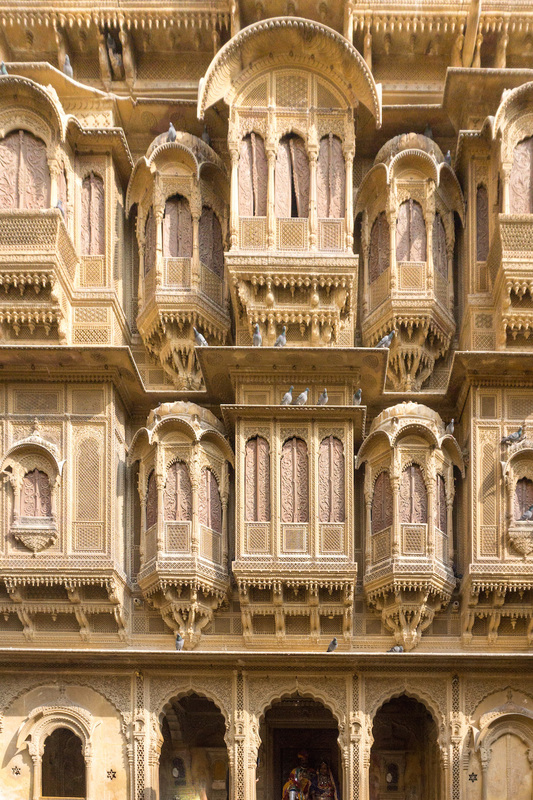 The rooftop of the Patwaon ki Haveli also has the best view of the Jaisalmer Fort! So it’s definitely worth paying the nominal fee to get inside. 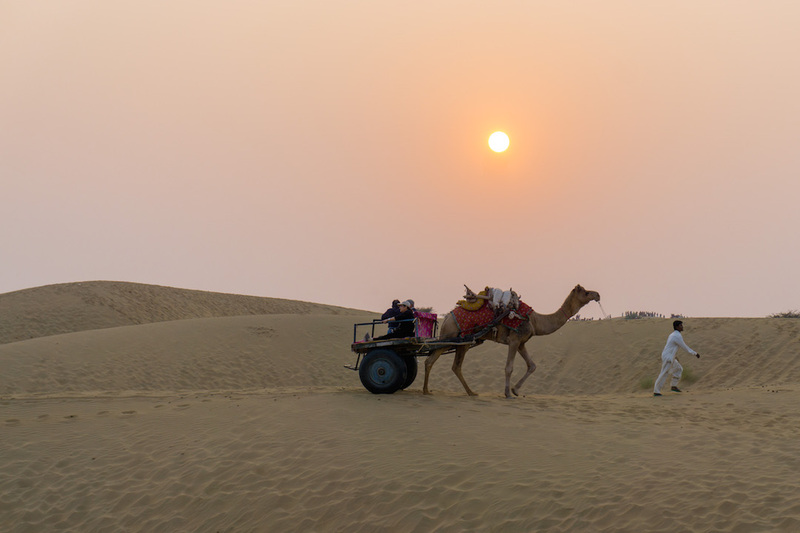 The Thar Deserts and it’s few remaining sand dunes are also a short car ride away from Jaisalmer. 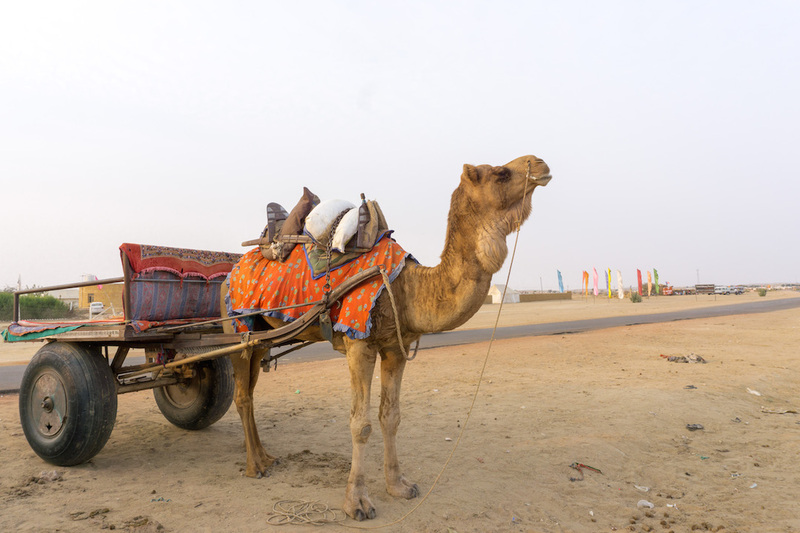 You could ride a camel, or take a camel cart to view the dunes at sunset! 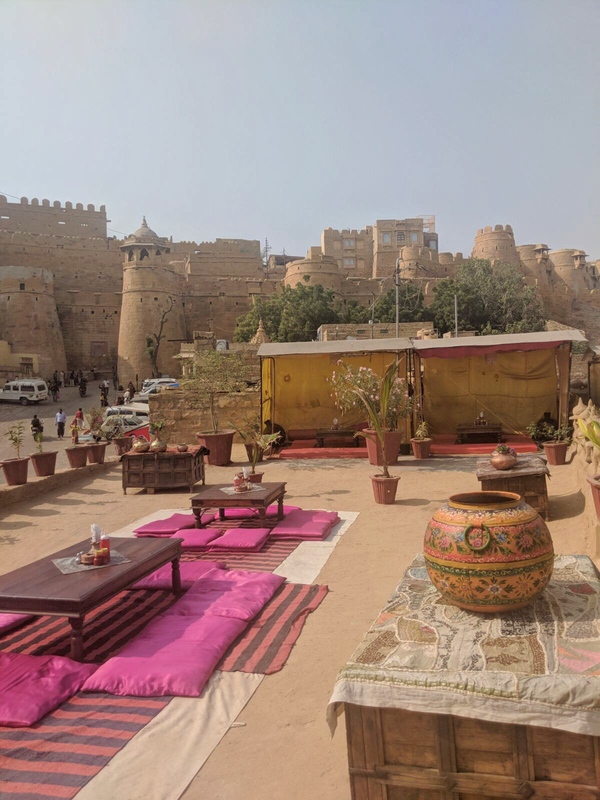 The tourist industry in Jaisalmer will ask you to stay at one of the “choki dhanis” to experience a proper Jaisalmer dinner and dancing. If you are really into cultural dances, this might be for you. My personal opinion is that it’s not really worth it. 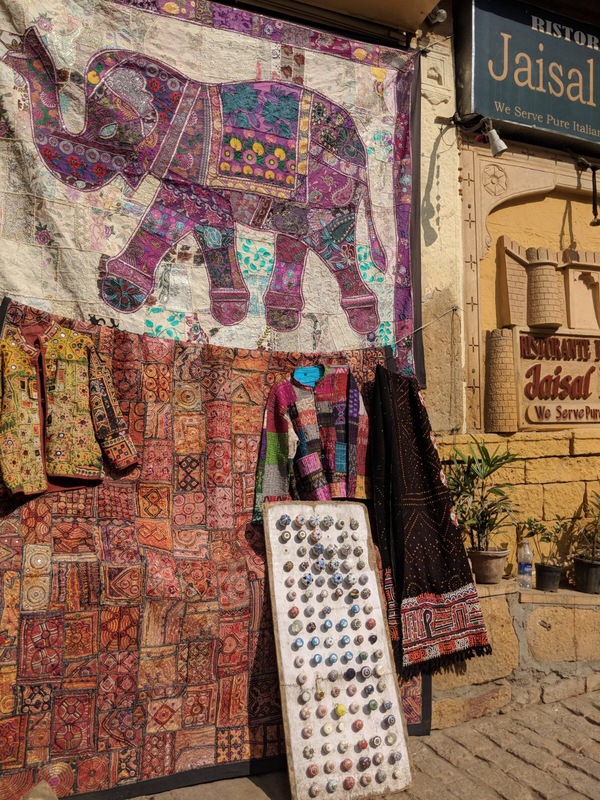 Jaisalmer street shopping is colorful and fun! As mentioned in my Jaipur blogpost, you have to bargain, and asking an Indian grandma for help ups your chances of getting a good price. I think watching my grandma at work, bargaining for the entire family, was more of a treat for me than the actual shopping! Convinced yet? 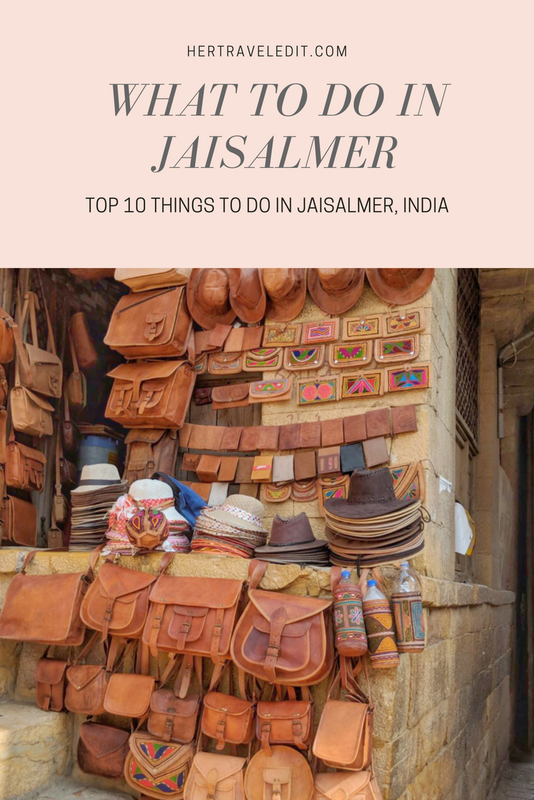 Please let me know in the comments if you want to visit Jaisalmer, or what you thought about it if you have visited! Note of Caution : Jaisalmer is dirty. 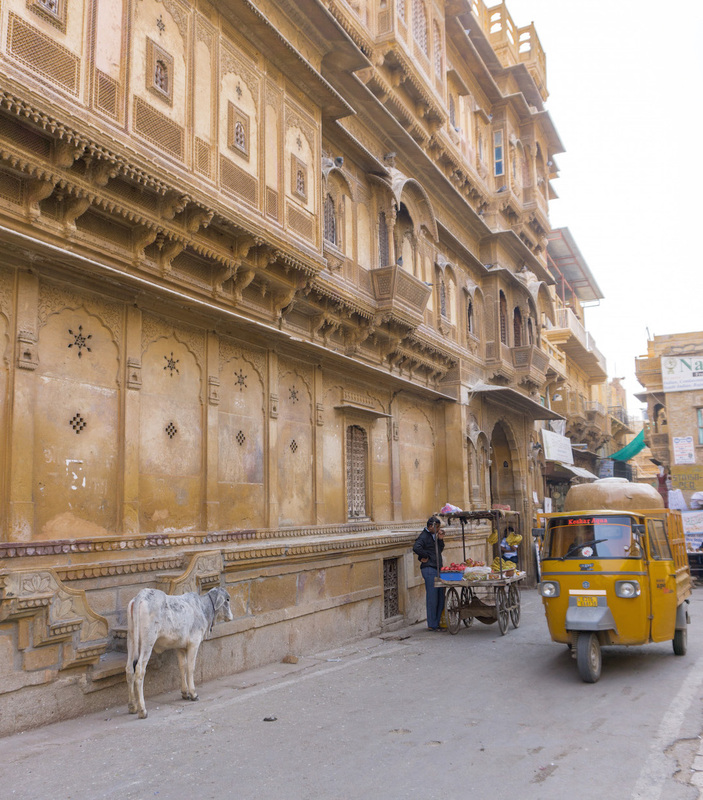 Much dirtier than the other popular Rajasthani cities of Jaipur, Jodhpur and Udaipur. The restaurant scene isn’t as great as the other places. However, the people are kind, the atmosphere is welcoming, and the ten reasons above show why it’s so worthwhile! 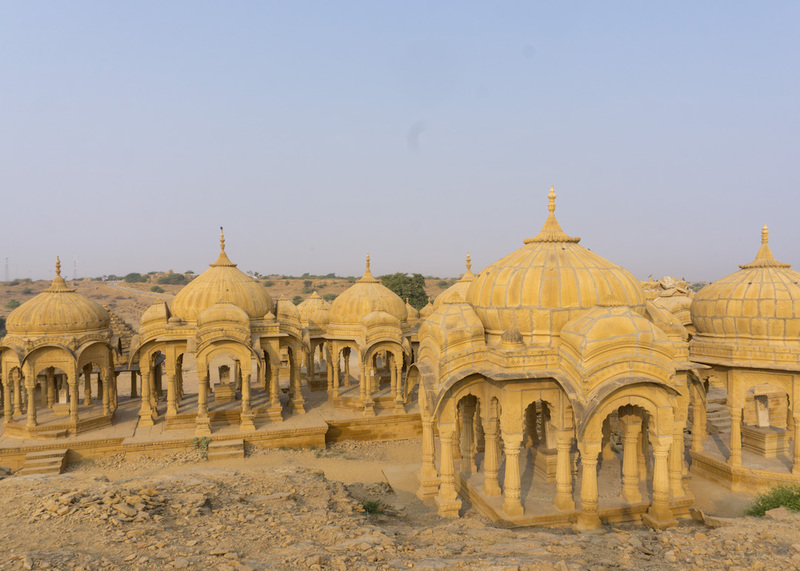 I hope you can overlook the dirt and pollution while making your opinion about Jaisalmer. 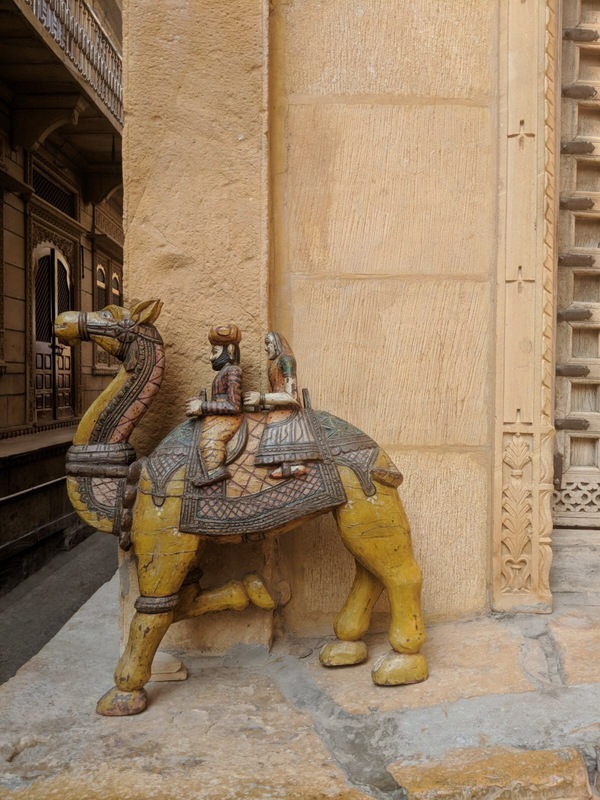 I highly recommend the Marriott, Jaisalmer for your stay. It’s a new hotel, so don’t expect any charm or character in the building itself. However, the service is beyond excellent, the rooms (especially bathrooms) are very clean and the food is great! aww thank you!! 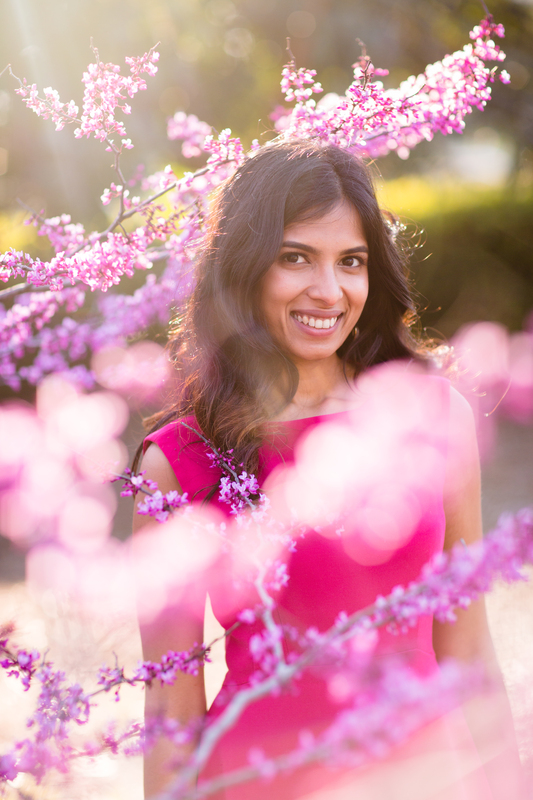 <3 Hope you get to go on your next visit to India! It has been the setting for a few movies as well! 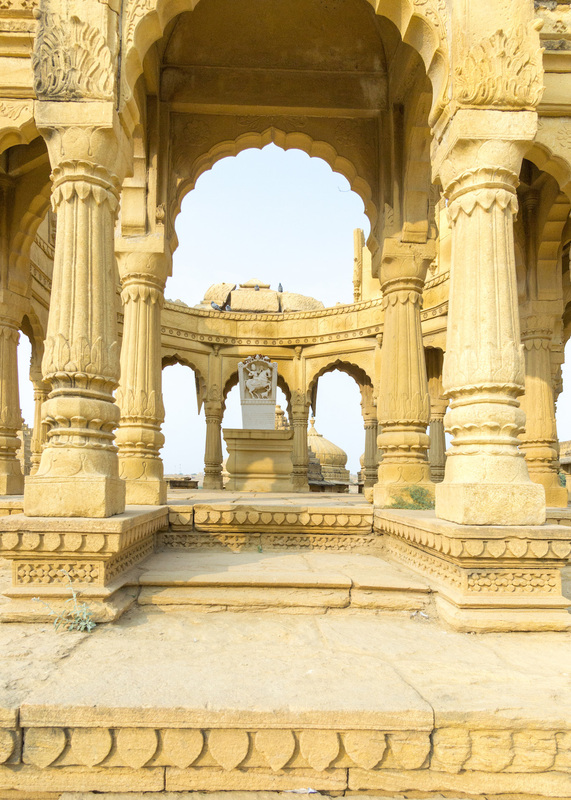 Indian history is so old – and so many changes happened, but a few things like the fort held their ground! It was amazing to experience it. P. S : I had to google Giorgio de Chirico – such interesting work! liked the simple and practical style of giving information . we are planning to go to rajasthan in a couple of weeks so your post would be very helpful. Thank you so much! I hope you have a wonderful Rajasthan trip!